<b>&quot;This Thanksgiving, set the mood with a story of gratitude.&quot; -- CHILD</b> <p></p>Thank you, Mother Earth.<br />Thank you, Father Sky.<br />Thank you for this day. <p></p>How can a young boy ever show his gratitude for all the beauty he sees? He will learn from his father, who thanks the earth and the sky, the frogs and the crickets, the hawk and the deer, even the trees that wave their arms in the breeze. 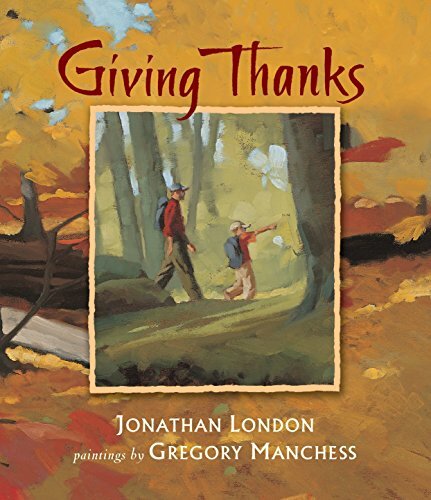 Majestic as the most beautiful autumn day and filled with glimpses of favorite woodland animals, GIVING THANKS is truly a gift to readers from nature-lover Jonathan London and master painter Gregory Manchess. Jonathan London is the author of numerous celebrated children's books. His commitment to honoring the wonders of the natural world has been lauded by readers and critics alike. About GIVING THANKS, Jonathan London says, &quot;Like the dad in the story, I give thanks to 'the things of nature' every day. Of course, my young friends call me a tree hugger! But they're right. I am!&quot; Jonathan London lives with his wife and two sons. <p></p>Gregory Manchess is a self-taught artist whose paintings have been seen in such magazines as NEWSWEEK, TIME, ATLANTIC MONTHLY, READER'S DIGEST, and NATIONAL GEOGRAPHIC. He has received gold and silver medals and the coveted Hamilton King Award from the New York Society of Illustrators for NANUK: LORD OF THE ICE by Brian J. Heinz. About GIVING THANKS, he says, &quot;This story is a timeless expression of the love for nature and understanding our place in the realm of life . . . an understanding that children develop so quickly.&quot; This is his first book with Candlewick Press.